The Irish Economy – Out of one wood, into another? This is a version of my column published in the Irish Examiner 8 Feb 2014. It takes a long time to recover from a banking crisis. If we were unsure of that we need but look around and notice that we still are talking and fretting about ours. Seven years ago Irish bank shares share prices were at or near all time highs. Lending for house purchases and deposits inflows to Irish banks were also at all time highs. So also were house prices. And then it all began to unravel. The children born at the bursting of the bubble, who will carry the cost most of their working life, are now in senior infants or first class in school. And still it isn’t fixed. Only this week do we see the first criminal trial arising from the banking shenanigans. This week also we saw a report by the EU which sharply criticized our lethargy in dealing with bringing criminal, especially white collar, trials to justice. The Cowen government moved neither swiftly nor decisively when the storm hit. But things may be changing. At the annual meeting of the Allied Social Sciences, a sort of Woodstock for economists and likeminded folks, a paper was presented on banking crises. The link above is to the paper – there is a longer version but it is firewalled. Reinhart and Rogoff have previously come in for some (more or less justified) stick on account of a missed spreadsheet error in one of their papers. The paper in question was at the heart of the meme propagated that after 90% debt/GDP countries enter a death zone. However, to my mind their more important work by far is in economic history, where in a series of books and papers they have provided comparative data on banking crises and bubbles. Much of the problem with modern macroeconomics is a twin crisis of insufficient data and a lack of a historical perspective. There is no excuse for this in the area of banking crises as we have not only the work of RR but also a comprehensive database from the World Bank. The RR work provides details of 100 banking crises. Its well worth reading. The main finding is that the effects of the crisis take a long time to peter out. In 50% of the cases real GDP per capita has not recovered to pre crisis levels even after 6 ½ years. On average it takes 7 years. Ireland has had a really severe banking crisis. RR create a measure of the crisis severity – the data are shown below. In terms of the post WW2 period it ranks in the top ten most severe crises as measured by declines in per capital GDP. What is however apparent is that we may, based on the real GDP per capita data available, be right on target to be an average recovery. Our GDP figures of course are somewhat distant from the reality of people on the ground, but the fact remains that GDP is what the rest of the world measures as being available for the state to distribute. That we have chosen to in effect shelter a large chunk (the fdi sector) is our own decision. Mind you, with the international moves to make tax arbitrage by MNCs less attractive, how long the GNP/GDP wedge will persist is debatable. This does not mean we are out of the woods by any means. Entering the crisis with a healthy debt to GDP ratio of 25% in 2007 we are exiting it with one closer to 125%. Whether high debt causes slow growth, slow growth high debt or more likely both working together, this ratio needs to come down. And herein lies a problem. Europe, and Ireland, are teetering on the brink of deflation. We are used to inflation – rising prices. Deflation however is where prices fall. And while inflation can be bad at high levels deflation at even moderate levels is disastrous. With deflation there is little incentive to spend – prices will fall so why spend now. There is little incentive for firms to invest in new products –demand will be depressed until people consider that prices are likely to stabilize or rise. And for those with debts, that including states with high debt/gdp ratios and households with mortgages and personal debt, it is ruinous as the real level of debt increases over time. At a wholesale level, the price that companies get, deflation is already a reality. 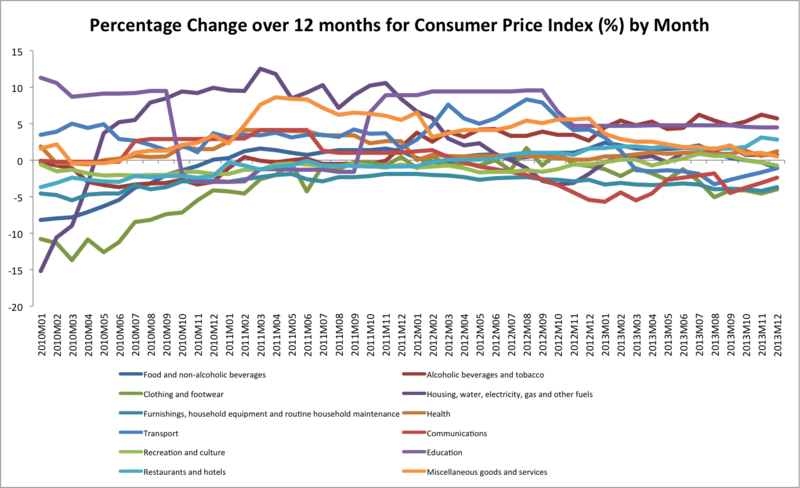 Across a wide swathe of the Irish economy prices have been falling for 6 months or more. This is particularly evident in manufacturing and related areas. Indeed, surprising as it may seem to the consumer, it is also the case in most food areas, save dairy. At the consumer price level of the 12 main categories of goods and services 6 have shown deflation in the last two months. Indeed since 2010 deflation has been the norm in clothing, furniture, communication and recreation. At a European level overall inflation is now close to zero. What is needed is moderate, 3-6% inflation. The ECB, again, is in the firing line, as it controls the money supply. However facing broken banks and close to the zero interest rate bound there is a limit to what monetary policy can do. Eurozone governments cannot pump inflation by fiscal means as they are constrained by the various macroeconomic treaties. We are heading for a decade or more of stagnation unless the ECB can both clean the banks and prime the pumps. What chance that ? Draghi has dismissed deflation as a risk – in his press conference he noted that while there was some deflation (but he didn’t call it that) in the program countries (Ireland, Greece, Spain and Portugal) this simply didn’t matter for the core. We have left the woods of austerity for the darker woods of deflation. And nobody who matters cares. This entry was posted in Blogpost, Journalism and tagged banking crisis, ECB, economy, Europe, Fiscal Compact, government, Irish Examiner, share prices on February 8, 2014 by brianmlucey. The lesson actually is different. Recoveries vary enormously. See the working paper version by me, John Devereux, Scott Baier and Robert Tamura at http://papers.ssrn.com/sol3/papers.cfm?abstract_id=2269676. (Published in JIMF). Mike Bordo has written a couple of excellent papers too. The interesting question is why the length of recoveries vary dramatically. The answer to that is “We don’t have much evidence.” R&R are telling a story about long recoveries that is not supported by the evidence any more than the 90-percent-debt rule was.